The adjustable, rust-free pole uses tension to fit between your bathroom floor and ceiling so no drilling is required,, give you a clutter free bathroom. The pole is topped with a spring, providing the tension needed to hold the pole in place. Item: 3 Tier Bathroom Rack. 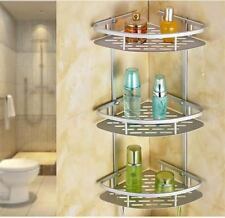 1 3 Tier Bathroom Rack. Double hook design, saving bathroom space and increasing load bearing capacity. Material: solid Space aluminum. Anti-lock technology, solid and durable, never fall off. Strong & durable. Can be extended to an approximate length of 83 cm. New Arrivals. This does not affect your statutory rights. What do we do?. We source top quality products from all over the world to bring you fantastic deals across a massive range. Material: Stainless Steel (rustproof). Other side with 3x magnifying mirror. Elegance for your bathroom. One side with 1x mirror surface and. Exclusive wall mirror. One side with 1x mirror surface. 22cm X 2.70cm (Screw Distance 190mm). This thick and chunky handmade bath caddy is made from Decking board and solid pine then finished in a teak stain which gives this piece a lovely rustic/industrial look. Wine / tablet / beer / tea pot not included . Mit 70 cm Breite bei Gesamtmaßen von HBT: 5,5 x 70 x 16,5 cm ist die Badewannenablage für normale Wannen ausgelegt - Einfach auf Ihre Wanne legen und die praktischen Funktionen der Ablage genießen. Ergänzen Sie Ihre Bambusmöbel - Wer schon auf Bambus setzt, wird mit dieser Badewannenablage große Freude haben - Ein dekoratives Highlight für jede Einrichtung - Natürlicher und eleganter Look. KEEP IT NEAT! Kryllic’s Clear Acrylic Cotton Ball & Swab Storage Case is an essential item for bathroom and vanity storage. • Conveniently Transparent. ORGANIZE YOUR VANITY STASH: Tired of struggling to keep all your makeup stuff from turning into a disastrous jumble inside your bathroom drawers?. Then look no more! Super convenient, uniquely stylish and space-saving, this makeup organizer is a must-have for your vanity collection! AMPLE STORAGE SPACE. Kryllic Is the Clear Way to Go! With the Kryllic Clear Acrylic Vanity Organizer in your view, you are poised to bring a new level of class to your bathroom, kitchen or office. To ensure long-lasting strength and use, the Kryllic Vanity Organizer is expertly constructed with durable, acrylic material. 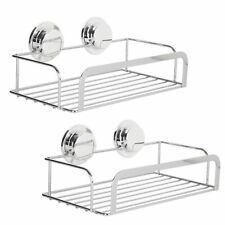 CommodityBathroom Corner Shelf Rack Shower Caddy. TypeCorner Shower Caddy. The adjustable rust-free pole uses tension to fit between your bathroom floor and ceiling so no drilling is required. The adjustable, rust-free pole uses tension to fit between your bathroom floor and ceiling so no drilling is required. 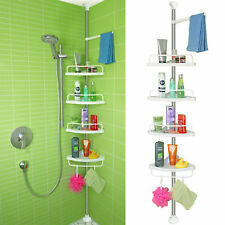 A nifty shower caddy that simply hangs over a door or shower screen to provide essential bathroom or wet room storage. Simply hangs over a door or shower screen. 3 large and deep storage baskets with guard rails. THE SOLUTION IS HERE: Are you tired of seeing your makeup accessories widespread in the house?. You consistently can’t find your eyeliner?. You need to be more organized, but you don’t know where to start?. SHOWER CADDY. EASY TO HANG IN THE SHOWER WITH THE BUILT IN HOOK. 2 TIERS FOR STORAGE. WIPE CLEAN WITH A DAMP CLOTH. Kryllic’s Clear Acrylic Cotton Ball & Swab Storage Case is an essential item for bathroom and vanity storage. These cases are ideal for use in your bathroom or vanity, however their neutral & classic design lends itself to multiple purposes. Umbra Flex Single Shelf Caddy - White. This "flex"-ible shower caddy gives you the freedom to hang your shower essentials wherever on the shower head, on the rod or over the door. Features: Versatile shower caddy lets you hang it on the shower head, rod or over the door. Made from rubber and moulded plastic. Store a variety of shower essentials, incuding large (industrial size) shampoo and conditioner bottles. 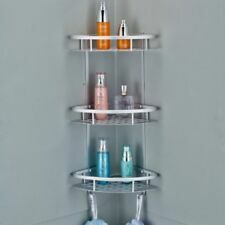 Convert standard-shaped shampoo and conditioners into dispensers using shelf cutouts. Flexible silicone straps let you hook to a single source or on 2 points. Cut-out hole in each shelf converts bottles into dispensers. Incorporated soap dish on shelf, razor pocket in silicone straps and side hooks for shower accessories. 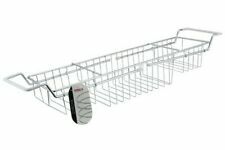 Flex single shelf caddy measures approx. 41.3 x 61 x 10.2cm. Handmade here in the UK this beautiful Wooden Bath Board from solid pine. 1 Wine Glass Holder. Slot for Smartphone & Tablet. 3 Candle Holders. Colour: Dark Oak. Vacuum Loc Wandablage Sensationeller Halt dank Vacuum-Loc Prinzip! • Platzsparend und griffbereit • Ohne Bohren - ohne Schrauben • Hält auch auf unebenen Flächen • Immer wieder verwendbar • Keine Beschädigung der Fliesen • Inklusive Vakuumpumpe Das patentierte Befestigungs-System erzeugt ein einzigartiges Vakuum mit der Pumpe. Mit 33 kg Zugkraft pro Befestigungs-Loc ist es deutlich stärker als ein Saugnapf. Die starke Dichtung sorgt für stabilen Halt und gleicht auch Unebenheiten (z.B. auf Fliesen) aus, ohne Bohren, ohne Kleben. Sekundenschnell fixiert, immer wieder verwendbar, rückstandsfrei zu entfernen. Material: Metall/ Kunststoff verchromt. Badregal Duschregal. Duschkabinen Hänger. Duschstangen Hänger. Sofort Kauf. Glaskabinen Hängere. Glasbausteine Hänge. Weiß Ersatz-Duschvo. Edelstahl und Rostf. Badablage mit 2 Haken und Kleber inklusive. Maße: 26x10x6 cm (Breite x Tiefe x Höhe) Belastbar bis 10 kg. (rostbeständig, langlebig und antistatisch). Hanging shower caddy - no drilling necessary! Simply place over shower door or screen. Boasts three spacious baskets for all your shower essentials. Relax and soothe your worries away - enjoy your bathtub with the Tub Bath Caddy Tray. Its generous size and smart expandable design allows for storage. Y ou can use it as your shower and bath caddy. 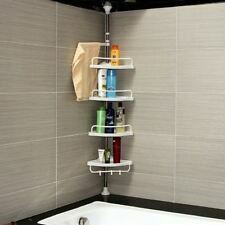 Clear up space on your bathroom counter and drawers with a little help from this multifunctional bathroom organizer! Multiple functions of storage: 1-flat panel at your service; 2-ventilated cylindrical canister for collecting combs or brushes; 3-2 towel hooks for hanging anything available; 4-hair dryer holder w/ L-type slot for plug and cord organization. Can be used on a corner of the bath, shelf or on the floor. Bathroom Accessories. 2 Tier Standing Corner Caddy. Kitchen Appliances. Kitchen Accessories. Boy's Girl's Sleep Lounge wear. Ladies Sleepwear / Lounge Wear. Perfect for your bathroom. Due To The Different Monitor And Light Effect, The Actual Color Of The Item. Handmade here in the UK this beautiful Wooden Bath Board from solid pine. All of our items are individually hand cut, sanded by hand, stained and protect with varnish and carefully constructed to the highest of quality.colours may vary slightly due to seasonal wood. This is a solid piece of furniture and ready to use. Dimensions:L-70cm x W-15cm x H-1.8cm Slot for Smartphone & Tablet 3 Candle Holders 1 Wine Glass/Cup/Can Holder Colour: Dark Oak Perfect Gift For Christmas, Wedding, Valentine's Day, Birthday, etc. Please note, wine / candle / phone is not included. ANY QUESTIONS? - WE ALL HAVE THEM JUST DROP ME EMAIL AND I WILL HELP YOU! THANKS FOR LOOKING! Ample storage space for shower gel, shampoo etc. Fits from ceiling to bath or ceiling to floor. Easy To Fit. Dem Nutzen dieses Regals sind keine Grenzen gesetzt: Bestücken Sie es mit Seifen, Shampoos und anderen Badeutensilien, mit Pflanzen oder Fotos, mit Gewürzen, Ölflaschen oder Topflappen und Geschirrtüchern! Der Munchkin Badewannen-Caddy ist einfach genial! Das Highlight ist seine Flexibilität, denn das Modell ist praktisch an jede Wanne anpassbar und rutsch auch nicht hin und her, wie viele Billigmodelle. Zwei in einem - dekorativ und praktisch bietet das edle Exklusiv Wandregal aus glänzendem Chrom viel Platz zum Ablegen und Aufbewahren. 2 bewegliche Handtuchstangen, Chrom, 45.5 x 54.5 x 25 cm. Zwei bewegliche Handtuchstangen. Acrylic organizer Set of 7 Large Drawers for Makeup jewelry Office Supplies. Acrylic Makeup jewelry cosmetic organizer Set of 3 Drawers with Lipsick Holder. Acrylic Makeup jewelry cosmetic organizer Set of 4 Drawers with Lipsick Holder.